In a recent issue of Commentary, the editor (John Podhoretz) affirmed the magazine’s commitment to literature, and said that it often published unsolicited short fiction. Podhoretz said that Commentary had long been committed to literature, and that in one of its first issues, it had published a story by the Russian-Jewish writer, Isaak Babel. The story was called “First Love,” and Podhoretz said it was “universally considered among the greatest short works of the 20th century.” I decided to have a look at the story, and try to learn more about Babel. I also read Babel’s “Crossing Into Poland,” a very short, very powerful story that I found in the textbook Understanding Fiction. “Crossing Into Poland” seems to deal with a 1920 pogrom in Poland. It’s an excellent story. One of Babel’s major works is a short-story collection, Red Cavalry, which deals with the Russo-Polish War of 1920.1 Babel also wrote Odessa Tales, about Jewish gangsters. As for Babel criticism, two of the most famous American critics have written about Babel: Lionel Trilling wrote an introduction to Babel’s Collected Stories (New York, 1955), and Harold Bloom wrote Isaac Babel (1987). Before I met Babel, I used to read a great deal, though without any particular direction. I read whatever I could get my hands on. Babel noticed this and told me, “Reading that way will get you nowhere. You won’t have time to read the books that are truly worthwhile. There are about a hundred books that every educated person needs to read. Sometime I'll try to make you a list of them.” And a few days later he brought me a list. There were ancient writers on it, Greek and Roman — Homer, Herodotus, Lucretius, Seutonius — and also all the classics of later European literature, starting with Erasmus, Rabelais, Cervantes, Swift, and Coster, and going on to 19th century writers such as Stendhal, Mérimée, and Flaubert. Did Babel have a self-destructive streak? He had been living in Paris, and might have survived if he had stayed there, but he chose to return to the Soviet Union, though he knew he might be in danger there. Perhaps he returned to the Soviet Union because there he was a professional writer, a respected writer, even a celebrity, while in Paris, he didn’t enjoy that status, and he would have had to scramble to make a living. there is something missing in all of Nabokov’s work. His starchy aestheticism comes through as cold, crystalline, and almost inhuman. We wait in vain for that warm human glow that pervades all the works of Gogol, Turgenev, Dostoevsky, Tolstoy, and Chekhov. And his work lacks the psychological or emotional depth that might have compensated for the limited range of characters and situations. I recently heard Dean Radin speak in Providence. Radin’s specialty is parapsychology, and he has spent much of his career working at the Institute of Noetic Sciences (IONS), which conducts parapsychology research. The Institute is based in Petaluma, California; it was co-founded by Edgar Mitchell, an astronaut who had a mystical experience while in space. In an earlier issue, I discussed Radin’s book, The Conscious Universe. Radin was in the Providence area because he had been invited to speak at the Naval War College in Newport. The Navy has a program that ponders what war will be like in 30 years, and they invite speakers who are unconventional, out-of-the-box; they seem to have a particular fondness for Radin’s talks, and they’ve invited him three years in a row. It was a good talk. Radin discussed recent research, recent experiments, much as he does in his books. He described testing whether people could affect a light beam in the next room, by imagining themselves blocking the light beam. He said that experienced meditators from India could do this more effectively than other people. One meditator, who was especially adept at affecting the beam, created some sort of aura/energy in the room, an aura that made several people in the room feel disoriented, spacy, at the same time. Radin also mentioned a woman named Dadi Janki, who seems to perpetually possess this aura/energy — something that people can feel when they come within fifty feet of her. Dadi Janki is still active at age 94; she’s part of an organization called Brahma Kumaris. Meditators may be able to anticipate the future, see the future, more than other people. Radin said that an experienced meditator seems to be beyond time — seems to feel past, present, and future together. Perhaps reality itself is timeless, perhaps our sense of time is just a mental construct, and meditators are better able to see reality as it really is. I asked Radin what he thought of psychics like John Edward. Are they really communicating with the dead? He responded that tests have shown that John Edward isn’t fraudulent, but it isn’t clear whether he’s communicating with the dead, or reading the minds of people in the audience. I should have pursued this further, and asked him if tests could be done to distinguish between these possibilities. Since Radin is an expert on testing/research, I would think he could devise such a test. “What do you think about evolution? The rational-scientific view of evolution is that Darwin was right, evolution is driven by random mutation and selection of the fittest. According to this view, there’s nothing occult or mysterious in evolution, just lots of time, lots of chance, lots of struggle-to-survive. “But if occult forces permeate the universe, if we find them in everything from particles to people, how can they be absent from evolution? If the power of the mind, and the power of intention, continually amazes us, how can they be absent from evolution? If many things that are considered chance turn out to have some kind of pattern/meaning/purpose, can chance really be so important in evolution? Some Jungians have suggested that synchronicity is involved in evolution. Isn’t this more plausible than to argue that the human brain (and other complicated organs) evolved merely by chance-and-selection? “Religious people have long believed that Darwin’s theory isn’t the whole story, and today they speak of ‘intelligent design.’ But it should be noted that atheists like George Bernard Shaw and Nietzsche also believed that there’s more to evolution than chance-and-selection. They insisted that there must be a driving force behind evolution; they spoke of a Life Force, or a Life-Instinct, or a Will to Life, or a Will to Power. Such forces might be called metaphysical or occult. A. One might say that Eastern civilization is characterized by meditation, Western by contemplation. Meditation means being free of thoughts, aware of sensations. Contemplation is the opposite — full of thoughts, unaware of the world around us. 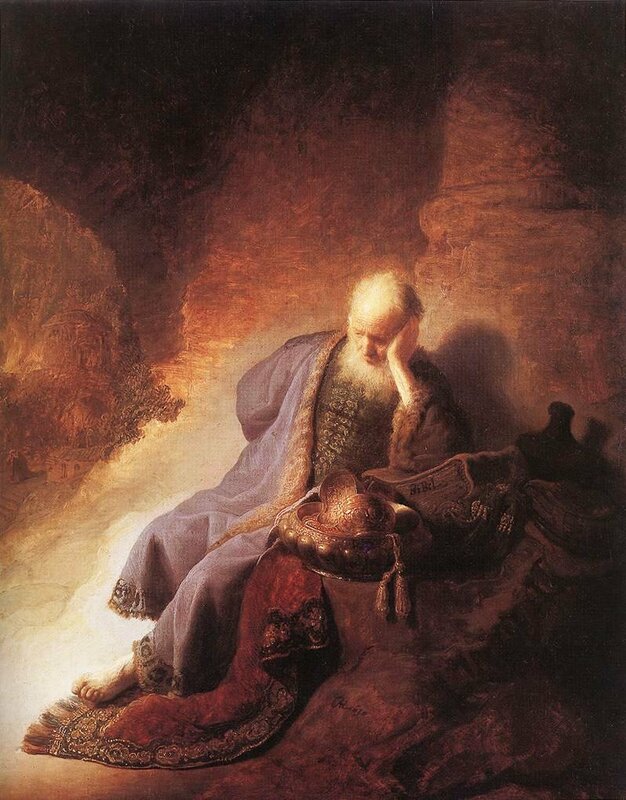 Rembrandt often depicts contemplation, as in his Jeremiah Lamenting the Destruction of Jerusalem, and his Aristotle Contemplating the Bust of Homer. Is the meditative attitude ever found in Rembrandt, or the contemplative in Eastern art? B. Perhaps the best recipe for a healthy personality and a successful life is, “Respect yourself, and respect other people.” How many school principals have told their students, “Respect yourself, and respect other people”? If, however, a young person is inclined to worship heroes, then he won’t respect himself (because he’s not a hero), and he won’t respect other people (because they aren’t heroes). Thus, hero-worship undermines psychological health and worldly success. C. Unsociable people seem to be characterized by feelings of guilt and of moral superiority. Sociable, outgoing people, on the other hand, seem relatively free of both guilt and superiority. The connection between guilt and moral superiority is a paradox; one might suppose that guilt springs from moral failure, and therefore is incompatible with a feeling of moral superiority. Here’s how I would resolve this paradox: a strict conscience (i.e., a strong super-ego) creates both feelings of guilt and feelings of moral superiority.2B It’s this strict conscience that unsociable people possess, and sociable people lack. An unsociable person is more self-conscious than a sociable person; perhaps the feelings of guilt and superiority are behind self-consciousness. I’m reminded of E. M. Forster’s remark that, at parties, he felt both self-conscious and contemptuous. In an earlier issue, I said “someone should write a ‘parallel life’ of Shakespeare and Goethe. There are many parallels between them.” I now find that Frances Yates agrees with that view. “The major European figure who is closest to Shakespeare is Goethe,” Yates writes.3 Yates’ specialty was Renaissance Hermetism; I’m not sure if she wrote about Goethe, but she probably understood Goethe’s Hermetism. In a recent issue, I mentioned that the English alchemists, John Dee and Edward Kelley, were in Bohemia in Shakespeare’s time. Yates traces the influence of English Hermetists (perhaps including Shakespeare) in Germany and Bohemia, then says that this Hermetism may have been linked to the Hermetism of Goethe and the German Romantics — it may have lingered in Germany from 1625 to 1775, then revived in Goethe and the German Romantics. We saw earlier that the English Romantic, Keats, understood Shakespeare’s Hermetic side, and praised Shakespeare for his acceptance of the mysterious and non-rational. Did Goethe also grasp Shakespeare’s Hermetic side?